Bugatti EB 110 possesses appearance of a wild, unrestrained animal. The body consists from light-alloy body panels. In Bugatti EB 110 the body from a carbon fiber is applied. This material extremely tight and is easier than a steel or aluminum alloys. The body bears system of an all wheel drive and a gear box placed before middle-placed engine and connected with differentials of front wheels. Internal stuffing of this monster impressive enough: the 12-cylinder engine a working volume of the central arrangement of 3,5 l, having on 5 valves on the cylinder, attractive turbochargers of the quad carburetor; at 8000 ob./minutes engine power made 560 h.p. ; dispersal from a place to 100 km/hour in 3,4 seconds, to 180 km/hour – in 10,8 with. At speed of the car to 160 km/hour the motor, unlike similar bellowing engines V12, works with low, hardly distinguishable noise, but it is necessary to move only the lever of a 6-speed manual gear box, and you hear the muffled growl of the predator ready to a jump. The engine block is made from aluminum; designers managed to reach a low compression ratio 7,5:1; combined efforts “Bugatti” and “Elf corp.” The technology of the dry lubricating system of sharp recession is created; powerful brakes for Bugatti EB 110 were projected by company “Bosch”, and “Bugatti” improved their design, supplying its ventilated with ABS. 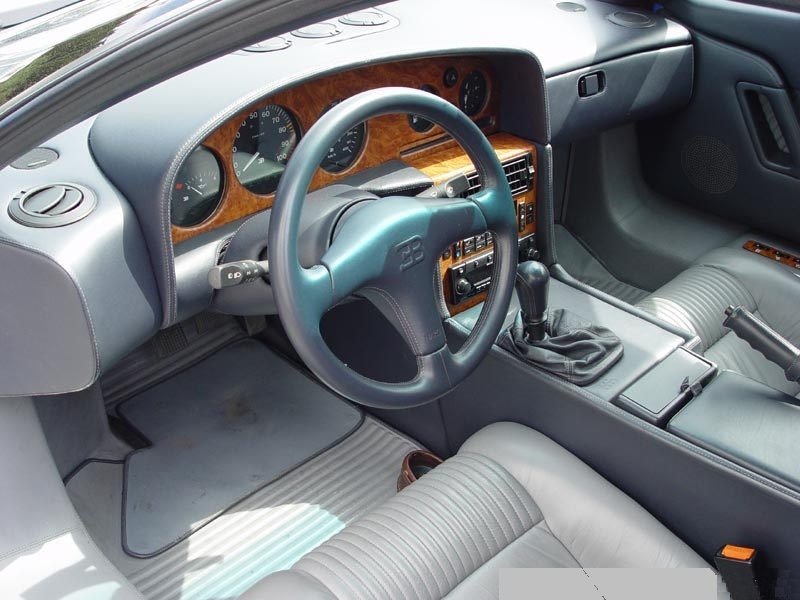 Bugatti EB 110 interior is finished by quality leather. The impressive meter panel contains hours, the air conditioner, electric programming of a seating and a stereo/CD the quality tape recorder of sounding. You get to interior through high arch doors, the interior seduces the leather places, a wheel more similar to a steering wheel of an air liner. To be elegant, to the car stirs an abundance of the details made obviously for show. This car was just the beginning, and we all know how it ended – the great Veyron was born later on..